Forge has the capability to build a wide range of quantitative and qualitative models to aid in SAR interpretation and activity prediction. The capabilities are summarized in the table and the individual methods are described in detail below. 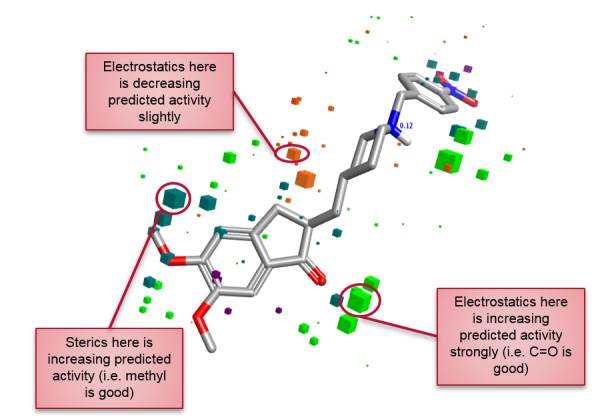 Cresset’s field QSAR method uses the shape and electrostatic character of aligned molecules to create an equation that describes activity. Unlike other methods we use only a minimal number of descriptors that are based on an irregular grid rather that on a regular lattice, avoiding the problems associated with the orientation of molecules in Cartesian space. Full details are in preparation for publishing but please contact us for a personal, detailed description of the method. Field QSAR models provide a global view of your SAR data. They work well where the SAR landscape is smooth – small changes in a molecule lead to small changes in activity. Where a robust model is obtained it can be usefully employed in the prediction of activity for new molecule designs, aiding the prioritization for synthesis. Alongside each prediction the fit of a particular compound to the model can be studied to understand what is favorable or unfavorable about the design. 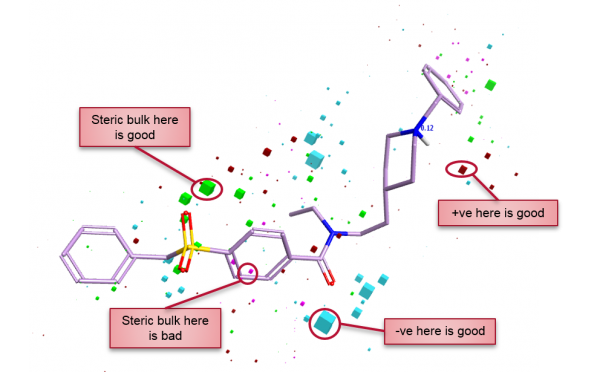 This gives feedback to improve the design but also aids in deciphering the model and the reason a particular compound is highly active or inactive. Activity Atlas is particularly useful for those project teams where there is not enough SAR for a traditional 3D-QSAR approach. Activity Miner is used to find and understand activity cliffs in your SAR. It can operate on both 2D and 3D similarity. Unlike Field QSAR and k-NN models it works well where the SAR landscape is particularly jagged. Activity Miner is described in detail here.